Physics, advice from an astronaut and the photographic memory of the Green Bay Packers’ quarterback have created the NFL's most unlikely lethal weapon. GREEN BAY, Wisc. — A crowd of reporters marches into the Packers locker room on Wednesday, armed with notepads, microphones and recorders. 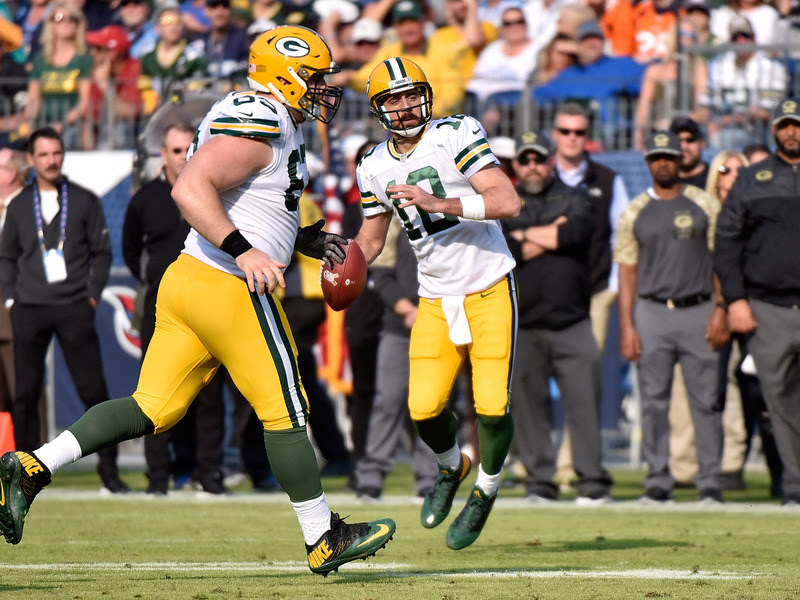 Most settle around the locker of Aaron Rodgers, the Packers’ cerebral quarterback, and while the questions vary slightly, one topic dominates all others. It’s not the Dallas Cowboys, who host Green Bay in a divisional playoff game this Sunday, their rookie quarterback sensation Dak Prescott, or even the Packers’ seven-game win streak. Instead, the questions revolve around a play that ranks among the most thrilling in sports and the most unlikely in football: A last-gasp, desperation heave thrown into a crowded end zone where the chance of conversion is so improbable the successful version is named after a prayer. The topic du jour is the Hail Mary, and how the Packers have completed three of them under Rodgers in a span of 402 days—a rate (60%) that is higher than overall completion percentage for some NFL quarterbacks. Rodgers last made the impossible look easy the previous weekend, with a 42-yard Hail Mary he snuck beyond a pack of Giants defenders to wideout Randall Cobb in the final seconds of the first half. The most outrageous thing wasn’t that the play worked as Green Bay had intended, even if the odds involved there fall somewhere between winning the lottery and dating a swimsuit model. The striking thing was that Rodgers and the Packers had pulled that play off again. Sometimes, Staubach wonders how history would be different if he hadn’t looked off the safety, or thrown the perfect pass, or if he had told the reporter he said Our Father or Glory Be. Maybe, he suggests, we’d call those glorious passes “bombs” or “alley-oops.” Perhaps the phrase “Hail Mary” would only be said in church, rather than by thrown around by football pundits, and it wouldn’t be used by long shots everywhere for everything from business dealings to first dates. Now, the Hail Mary is the football version of so you’re saying there’s a chance, the play that changes everything, the ultimate flipped script. That remains true outside of sports. Just last week, Staubach had a meeting at his commercial real estate company, JLL, and one of his employees said that to land a New York real estate deal would “probably take a Hail Mary to pull off.” Staubach just looked at him thinking, dude??? “I think it’s time to pass the mantle, anyway,” says Staubach, who will be at AT&T Stadium on Sunday for a potential Hail Mary Handoff. Not every long pass is a Hail Mary. Informal rules mandate certain qualifications. Rule 1: the throw must be long; ideally tossed from around midfield, definitely more than 40 yards. Rule 2: the throwing team must be behind. Rule 3: the game must be close; ideally the pass would tie or win. And Rule 4: there must be little time remaining; preferably in the game, or, less so, in the half. All truly famous Hail Marys fit within those guidelines. Like Doug Flutie’s desperation hurl for Boston College to beat Miami in 1984. Or Kordell Stewart’s late chuck to Michael Westbrook to devastate Michigan ten years later. There was even a so-called Fail Mary in Seattle in 2012. Naturally, the Packers were involved, and they thought (quite reasonably) they had defended a miracle touchdown only for the referee to rule that Seahawks receiver Golden Tate had simultaneous possession, which meant he scored the winning points. Think about those plays: The euphoria; the torn-down goalposts; the defenders slumped to the ground, their will shattered; the near-certain-loss-turned-into-immediate-shocking-triumph; the way BC fans know exactly where they watched the Hail Flutie. Then make an argument that the Hail Mary, when successful, isn’t the most spectacular play in sports. You can’t. Walk-off home runs? Please. Those happen more frequently and those at-bats can end in any number of outcomes. Even attempted Hail Marys happen rarely, and every time, they are epic or forgotten. There are significantly fewer triumphant Hail Marys than U.S. presidents. Then think about how many teams or players appear more than once on the list of famous Hail Marys. There’s just one player, Rodgers, and just one team, his. There was the 61-yard bomb to tight end Richard Rodgers in Dec. 2015 that beat the Lions and won an ESPY for Play of the Year. (In his acceptance speech, Rodgers the tight end thanked God because, “if it weren’t for God there wouldn’t be any Hail Marys.”) Then there was the 41-yard fling from Rodgers to wideout Jeff Janis that tied a playoff game last season against the Cardinals. (The Packers lost in overtime.) Then there was the one last Sunday. Think about that. Even 10-year-olds know the Packers convert the most dubious play in football often enough that it’s possible in every game they’ll find late magic once again. There’s more to that than at first glance. The Hail Mary might look random. It might seem chaotic. But for the Packers, and for Rodgers especially, it’s not. When I profiled Rodgers two seasons ago for an SI cover story what stood was the way his mind worked, how he processed information and applied science and math and physiology to football. His Packers coach, Mike McCarthy, guessed that Rodgers had a photographic memory. His high school baseball coach, Ron Souza, said Rodgers would stop by his classrooms on fall Monday mornings and diagram the blitzes, audibles and disguises that defenses deployed against his favorite team, the 49ers, from memory. He was 15. Cobb, Martin says, tracked the football better than any of the Giants defending the end zone. Why? The answer owes to preparation over luck. The Packers’ ‘Hail Mary’ package falls under a specific section of their playbook. The heading is “situational football,” and as described in a Milwaukee Journal-Sentinel piece from 2015, that tab “can feel like a choose-your-own-adventure book.” The Hail Mary designs reside next to plans for onside kicks after safeties, fair-catch kicks and last-minute lateral bonanzas—rare plays, in every instance, and more evidence there is no situation the Packers fail to prepare for. As has been noted since Green Bay’s third successful Hail Mary, the Packers practice desperation heaves each Saturday, same as most, if not all, NFL teams. But that’s a bit misleading. What they practice is alignment, how to set up the “Jumper,” or the player who is supposed to leap for the ball while his teammates box out, basketball-style, the defenders crowded in the Jumper’s vicinity. There’s also an element of spacing involved—some teams do it horizontally, some vertically, to force defenses to spread—and the Packers like to place one player behind the Jumper and one in front, in case the pass gets batted one way or the other, sails long or falls short. Rodgers has not actually thrown a Hail Mary in those Saturday practices since, he estimates, “Week 4 or Week 5.” Sometimes, his backup, Brett Hundley, will throw for him, and to prevent injuries the receivers don’t even try to catch the football, leaving defenders to bat it down. Other times, Green Bay only simulates the play, and there’s no actual pass. Most Saturdays, the Packers run through the Hail Mary scenario only once. More frequently, Rodgers slings 50-yard bombs down field at practice for the same reasons baseball pitchers long toss—to build arm strength. “He’ll just launch them,” the tight end Rodgers says, guessing the quarterback’s range is around 77 yards. It’s not just arm strength, though. It’s ball placement. “How many times do you see quarterbacks throw the ball out of bounds or put it in a position where offensive players can’t make a play on it?” Martin asks. All the time, of course. It’s not just ball placement, though. It’s buying time so that the receivers can set up and Rodgers can step into the throw. On each of his successful Hail Marys, Rodgers has had enough protection and moved into the right spaces to do just that. On the Lions one and the Giants one, he bought six seconds—an eternity in the NFL, and one reason Staubach wonders why teams always rush three defenders against a Hail Mary and drop eight into coverage. The Art of the Hail Mary is all that, all at once. For example: against the Giants, Rodgers says he noticed one cornerback “a little low,” so his mind calculated (in a split second, really) to throw it a little farther than the middle of the end zone. In his peripheral vision, he sensed “the ends were locked down, so it was a matter of maneuvering the front to create a throwing lane.” He shifted in the pocket, rolling right at first, until a lane opened. Then he stepped to the left and chucked. This is how his mind works: “The plays that happen on the field, the throws, I’ve done all those in practice,” Rodgers says. “We’re moving the pocket slightly, or not moving the pocket, or escaping and resetting the edge. You’re throwing it as high as you can and trying to judge trajectory and defense. It’s a matter of a quick mathematical equation based on your feel and your muscle memory.” Class dismissed. The play against the Giants contained all the elements of a proper Hail Rodgers. Cobb was spaced behind the designated Jumper, fellow wideout Davante Adams. Rodgers believed that temperatures in the teens would make it difficult to sail the pass out of the end zone. But he didn’t throw it as hard as he could, either, because the pass traveled roughly 60 yards, or well within his range. He wanted the heave to “hit a clean spot” and he factored in the wind like a golfer—or the friend of a famous astronaut. “How many athletes can say that?” he asks. As the ball shot toward the moon and then plummeted in a parabola toward the mosh pit in the end zone, the height of the pass seemed to confuse the Giants defenders, many of whom jumped too early, all of whom were in the middle or front of the end zone, not the back, where Cobb turned and hauled the pass in while falling to his knees. The Packers out-scored the Giants, 24-7, the rest of the way, in a blowout victory that was close before the latest Hail Rodgers. It wasn’t exactly how the Packers designed the play; there is no exact blueprint. But it was close. That statement rings both true and false. Most, if not all, teams practice the Hail Mary and prepare to defend against it. But I’ve never heard any quarterbacks detail “quick mathematical equations” honed under the tutelage of an astronaut. Perhaps the Hail Mary prayers that have been answered for Green Bay say less about the Packers and more about their quarterback, who has 22 touchdown passes compared to zero interceptions in his last eight games. Perhaps that quarterback should consider a second career—as a physicist. Either way, hail Rodgers, the new Hail Mary king.